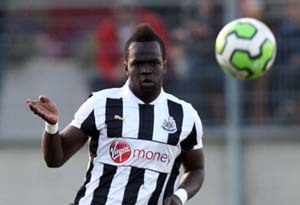 Colo and Tiote Start Against Rooney and Co.
As had been rumoured, both captain Fabricio Coloccini and Cheick Tiote start against Manchester United in tonight’s match. Alan Pardew has resisted the temptation to play Papiss Cisse from the start and instead had Shola leading the line with no doubt Haris Vuckic just behind, though Newcastle’s bench has a strong look to it. They are up against a strong Manchester United team including Fletcher, Cleverley, Rooney, Welbeck, Hernandez and Anderson. At the time of writing you could get 11-2 on Newcastle winning at Old Trafford with BetVictor, compared to 9-2 with Ladbrokes.